This feather eye mask is hand made with raised and glitter swirl designs, and a turkey feather bunch, accented with a clear jewel. Eye Mask is made of a durable plastic stronger than our paper mache mask. 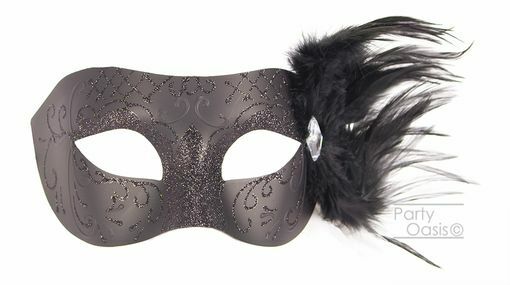 Each mask comes with satin ribbon ties, and measures 6.5�W x 3.5�H x 3�D.